ArisFlow 2.8.1 is available for download. The utility ArcMapView is now compatible for use with ArcGIS 10.3.1. The examples ArcMapModelBuilder and ArcMapPython are compatible with ArcMap 10.3.1. Regional settings other than "US" are now better supported by ArcMapView. Checking data with FGDBBrowser now ignores by default changes in index files. FGDBBrowser has a new optioin "-a" to check all files (including index files). Browsing data with FGDBBrowser now defaults to a list in alphabetical order. The geodatatypes example now also contains FGDB Raster data. Projects of earlier ArisFlow 2.x versions can be openend. Projects saved in version 2.8.1 cannot be be opened by versions before 2.8.0. Dialogs are openend with a default size and on a default position after starting ArisFlow. Dialog size and position will be remembered within an ArisFlow session (until closing ArisFlow). Special Directories, Environment Variables and Variables are new in Definition section of Print report. Removed obsolete components in Installation Setup. Support has ended for Windows Vista / Windows Server 2003 and older (but might still work). Windows 8 and Windows Server 2012 are new supported platforms. Projects saved in version 2.8.0 cannot be opened by previous versions. Many improvements of the execution log file containing valuable extra information about: Variables, Directories, Programs, Input and Output Data. Better layout of the execution log file. Help is now in CHM format so the help is suitable for Windows Vista/7/2008. The examples ArcMapModelBuilder and ArcMapPython are compatible with ArcGIS 10.1. The Utility ArcMapView is compatible with ArcMap 10.1. ArisFlow is released for Windows Server 2008 R2. ArisFlow will work with 64-bit Windows 7 and Windows Server 2008 R2 as 32-bit application. A new browser and checker for ArcGIS 10 File Geodatabase datasets: FGDBBrowser (uses "File Geodatabase API", so no ArcGIS license is needed). 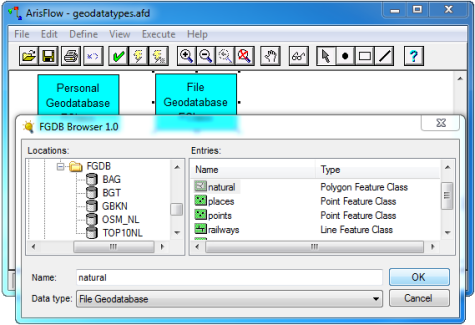 The new example geodatatypes.afd contains most user defined datatypes that use the geodatabrowser or FGDBBrowser for browsing and checking geographical datasets. 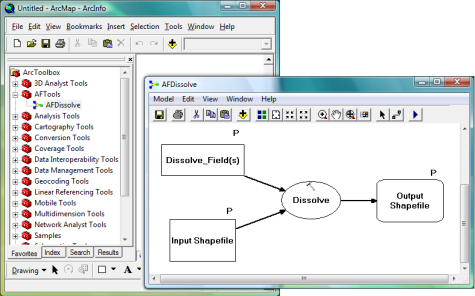 ArisFlow is released for Windows Vista and Windows 7. Existing ArcGIS examples work for ArcGIS 9.2 and ArcGIS 9.3. ArcGIS examples without VBA also work for ArcGIS 10.0. 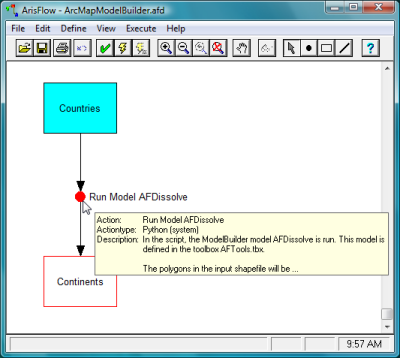 A new ArcGIS 9.3 and ArcGIS 10.0 example executing a model in ModelBuilder. See "What´s new" section in the ArisFlow Help for a detailed list of new features and bug fixes.